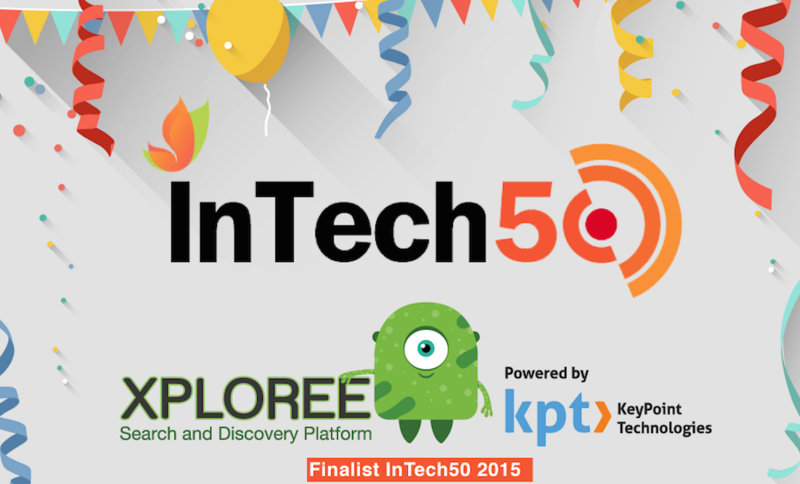 Xploree Search and Discovery – a Finalist at InTech50 2015! 2014 was an incredibly favourable year for Indian startups in regards to venture capital funding and higher market valuations. The positive sentiment is driving phenomenal growth in the Indian entrepreneurial talent and innovation in technology, all set to pave the way for a smarter future for the world. Sure, calls for celebrations, and we have our own very cool reason to celebrate this month. Excited to share that we have been selected by the renowned panel of InTech50 as one of the top 50 finalist among the leading Indian Startups at InTech50 2015! We are thrilled to be part of the amazing start-up entourage of Indian innovators and entrepreneurs this year and excited to showcase our innovation that we believe is the future of mobile search and discovery. InTech50 is a forum where selected startups get an opportunity to present a pitch and interact with global CIOs. The event also presents an opportunity for start-ups to collaborate or partner with other companies which often helps accelerate their products or services to scale faster. Last year, InTech50 brought CIOs and technology leaders from all parts the world to Bangalore. This year’s event also promises to be an enlightening one with 25 CIOs from top global companies, 25 CIOs from India and 25 investors, angels and accelerators expected from across US and India. Mobile advertising and brand messaging is often ineffective, irrelevant and irritating to mobile users. Users don’t want to be interrupted, they want to be in control and want to be empowered by a positive user experience. Understanding the disparity between the digital marketing models and consumer preferences, Xploree Search and Discovery platform (patent pending) is driving engagement through a 100% user-initiated, non-intrusive, search and discovery of brand offers, services and information in real-time on mobile devices. Xploree is powered by KeyPoint Technologies, an industry leader in innovative language technology offerings for mobile consumers that offers products in 120+ global languages including 30+ Indic languages. We present a tremendous opportunity for businesses looking for new customers who prefer to communicate in their local languages. Xploree has the distinct advantage of reaching out to a larger vernacular audience as compared to many other applications and platforms that are focused on English only marketing and content recommendation. With a successful beta launch in the India test market, Xploree is looking forward to collaborations and launch in the US, MENA and SEA markets later this year. We recently received an incredible response at Mobile World Congress (MWC) in Barcelona and at Ad:Tech India in New Delhi; our nomination at InTech50 2015 is adding to our delight and celebrations this month! We are looking forward to the event on April 15th and 16th at The Leela Palace, Bangalore. Our thanks to the iSPIRT team for organizing this opportunity to accelerate the Indian start-up scene and highlighting the new technologies that are ready to emblazon Indian technical excellence to the world. Follow our blog and our social media accounts (LinkedIn, Twitter, Facebook) to receive latest updates on Xploree.